TAÏB FASSI FIHRI, Minister of Foreign Affairs and Cooperation of Morocco, said the current session was taking place in a sensitive international context, in which the world faced acute and complex crises. Some, such as the climate change and the food crisis, were structural and persistent, while others, such as the financial crisis, were circumstantial. It was important to ask how the United Nations could adapt to this fast-changing world and how States could consolidate good governance. For its part, Morocco had established a democratic State that had been based on two interdependent pillars: the deepening of political reforms and the advent of human development. The recent adoption of a new constitution marked an historical development in the process by, among other things, consolidating the principle of separation and balance of powers, preserving the judiciary’s total independence and strengthening women’s participation in politics. He said the profound events and transformations in the Arab world proved both that social and economic development could not be achieved without political openness and democratic evolution, and that progress and ability could not survive in a politically stagnant and ideologically closed environment. Further, those events showed that each Arabic country had the capacity to build a political system that reconciled universal values and national specificities. Morocco called on the international community to support the democratic transitions in Tunisia and Egypt. As it had from the beginning, Morocco supported the Libyan people’s legitimate aspirations and all the moves and initiatives taken by the National Transitional Council at the national and international levels. The Moroccan Government hoped that Arab diplomatic initiatives in Syria and Yemen would prevent further bloodshed and guarantee the peaceful resolution of the crises there. In that context, it appreciated the response of the Group of Eight major economies in the Deauville Partnership. He further highlighted the need for a new regional governance structure based on regional integration of the Maghreb Arab Union, the Gulf Cooperation Council and the Agadir Agreement for an Arab Mediterranean Free Trade Zone. Under the umbrella of the Arab League, it should aim to build a new Arab order serving human development, economic integration and democratic openness. With the question of Palestine at an historical turning point, the United Nations must enable the Palestinian people to achieve their national legitimate rights, particularly through their admission as a sovereign State on the basis of the 1967 border, with east Jerusalem as its capital. Morocco also welcomed the positive signals in the recent statement by the Quartet ( United Nations, United States, United Kingdom and Russian Federation). The Government was also consulting with the Gulf Cooperation Council to establish an advanced partnership, and it renewed its support for the legitimate rights of the United Arab Emirates regarding its three occupied islands. Highlighting the new impetus to integration in the Maghreb, he noted Morocco’s relentless efforts to active bilateral relations with Algeria and its readiness to purse and intensify the negotiation process to find a consensual political solution to the artificial regional dispute over the Moroccan Sahara on the basis of the customary initiative that the Security Council, through six resolutions, considered credible. Recalling Security Council resolution 1979 (2011), he said it was time for each party to live up to its responsibilities, particularly in light of regional events. Stressing Morocco’s placement of African policy atop its foreign policy priorities, he noted its work to launch the Conference of African Atlantic States. He urged further international support for Africa’s development challenges and reiterated the call for a high-level meeting on investment in the continent. 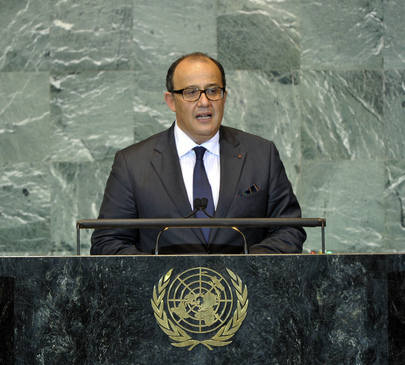 He also called attention to Morocco’s candidacy for a non-permanent seat on the Security Council for 2012-2013.